We have another raffle happening. 1 in 50 chance of winning! $20 a ticket for 2 nights stay at Executive Plaza Hotel Sept 13-15th and two full packages to the Convention. If you etransfer put your phone number in the comments/note section of the etransfer, as well as room raffle. Mike will take a pic of the ticket and send you copy. FOR ETRANSER ADD: conventionregistration@ca-bc.org to your payee on your bank account. Then also email password to that email as well. This email is set up to reach both our Registration Chair Simonne and Convention Treasurer Michael. 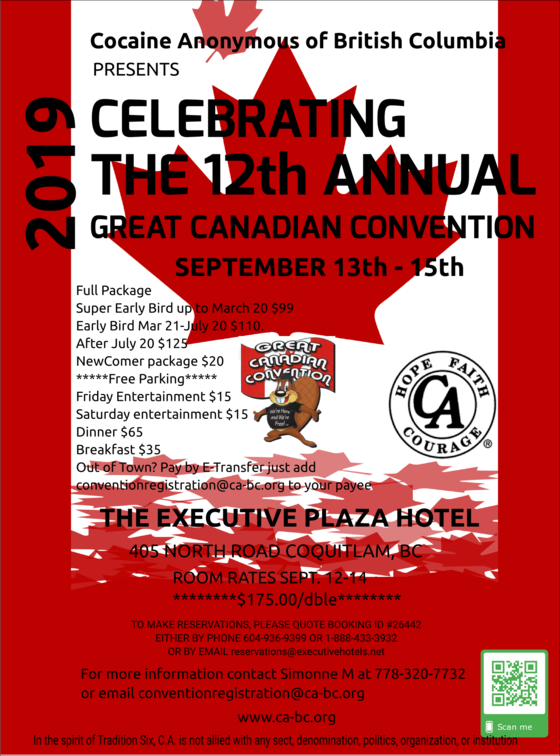 Reservations will be accepted by the hotel up until Monday, August 12th, 2019. Individuals will provide arrival & departure dates, preference for room type (ie" king vs double/double). Individual reservations may be received by email reservationsc@executivehotels.net or phone 504-936-9399 or 1-888-433-3932. Individuals must ask for the Super Natural Serenity rate, or quote BOOKING lD#26442 at time of booking to receive the group rate.